As Clear Lake Regional Medical Center celebrates its 40th anniversary, many in the medical community are remembering how it all got started. Dudney, like many doctors who had to put their patients in hospitals that were long distances from their homes, immediately liked the idea and “soon we sought out physicians all over the area,” Dr. Chapman said recently as he thought back to those heady days. Joined by a Friendswood physician, the late Dr. Joe Symon, “the three of us pursued things pretty hard, and before long, some 18 to 20 doctors practicing at Bayshore Hospital in Pasadena gave us their blessing.” And, their financial backing. The group bought a 70-acre tract bounded by Highway 3 and Texas Avenue from Humble Oil Charitable Trust and on George Washington’s birthday, Feb. 22, 1970, a crowd of 500 gathered at the Webster site for the groundbreaking of the $4.2 million facility. Webster Mayor Jodie McFadden, banker Walter Hall, who served as emcee; Dr. Robert Gilruth, director of the Manned Space Center, as it was called back then; Dr. Truman Blocker, president of UTMB at Galveston; Mrs. James Gilchrist, president of the Clear Lake Hospital Auxiliary; and Dr. William H. Rittenhouse, pastor of Nassau Bay Baptist Church, were but a few of the dignitaries joining Chapman, Symon and Dudney. NASA Recovery Operations Chief Jerry Hammack, speaking on behalf of astronaut Frank Borman, who had been called out of town earlier that day, congratulated the local doctors for their efforts to establish the hospital. Also taking part in the ceremonies were the Clear Creek High Symphonic Band, directed by Joe McMullin, and the Boy Scout color guard from Troop 502 in Webster. The 150-bed acute hospital was designed by McGinty Partnership architects so it could expand to 600 beds, with Spaw-Glass Construction Co., headed by Frank Glass, as the general contractor. A crowd of 3,000 was on hand Sunday, March 12, 1972 for the dedication and opening of the new Clear Lake Hospital, as it was called back then, including then-Mayor Jodie McFadden and attorney Floyd Myers, who is mayor today, along with Friendswood Development Corp. President John Turner and Webster State Bank Vice President Gene Lindquist and Dr. William Powell. Meanwhile Dr. Dudney and Dr. Symon quietly celebrated with Dr. Chapman, who was the first president of the hospital staff. The hospital was privately financed by 20 physicians practicing in Clear Lake City, Dickinson and Seabrook and 26 doctors at Bayshore Hospital in Pasadena, according to an article published in The News Citizen at the time. Since opening and delivering its first baby – Michele Elizabeth Hawkins, daughter of Mr. and Mrs. Richard Hawkins of Webster – the hospital has grown considerably and today is ranked as the safest hospital in the Houston area and fourth in Texas by Consumer Reports. Over the years, its name has changed from Clear Lake Hospital to Human Hospital-Clear Lake to Clear Lake Regional Medical Center. And, it has grown so much, it is barely recognizable when compared with 1972 photos. Around 2003, a new emergency room was added. 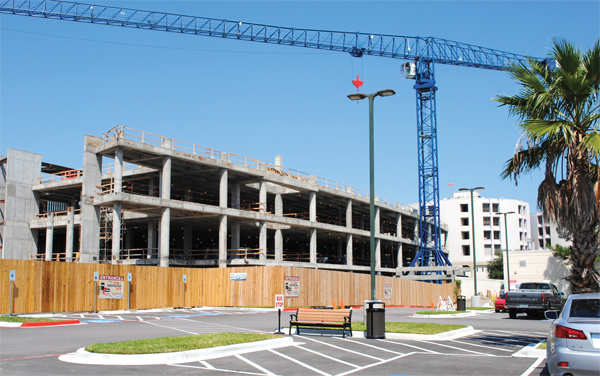 Then, in 2007, it completed the $55 million Heart & Vascular Hospital and spent another $17 million expanding that again in 2010, adding 72 additional private rooms, a pharmacy and dialysis unit. Then earlier this year came the announcement the hospital was beginning a nearly $92 million expansion that will include a 154,000-square-foot Patient Tower with state-of-the-art operating rooms, pre-op and recovery rooms, plus a 30-bed adult Intensive Care Unit and a wide range of renovations.